1934 Packard 1107 Town Car at 2010 Concours d'Elegance in Kirkland, WA. 1933 Packard 1001 Coupe Roadster at 2010 Concours d'Elegance in Kirkland, WA. 1934 Packard 1108, 12, Sport Phaeton, LeBaron at 2010 Concours d'Elegance in Kirkland, WA. 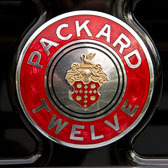 Most of the 1108 series Packards were given factory produced bodies. Only a handful received custom coachwork by such greats as shown here. The Sport Phaeton, a dual-cowl model that sold for $7,065, was more than enough to buy a fine home. Despite the size and the 5,130-pound heft, the LeBaron phaeton lived up to the “Sport” part of its name via a long hood and body, low roof, streamlined fenders and rear deack. Only 960 Twelves of all types were built for 1934, making the LeBaron Sport Phaeton very rare. 1937 Packard 120 Convertible Coupe at 2010 Concours d'Elegance in Kirkland, WA. 1937 Parkard Convertible Coupe at 2010 Concours d'Elegance in Kirkland, WA. 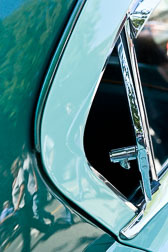 Barefoot photographer captures a 1937 Packard 120 Convertible Coupe at 2010 Concours d'Elegance in Kirkland, WA. 1960 Edsel Roadster. This Edsel was purchased in stock form in 2008 in Petaluma, California and was originally a sedan. Customization began in 2009 with the installation of a highly modified 429 cubic inch Ford V-8 and C-6 gearbox, and a new, lowered suspension with dropped spindles and ShockWave air-over dampers. Wildwood disc brakes were added in the rear to provide discs all around. The convertible conversion entailed substantial modifications that include a strengthened frame and a shorter, more raked windshield. 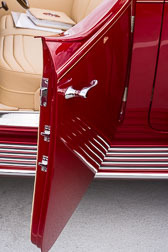 Numerous bodywork changes were incorporated including special fender skirts, a tonneau cover, and custom taillights. The interior has many new features including a redesigned dashboard and specially fabricated side windows. Owner: Bud Wolfe, Graham, WA. Photographed at the Pacific Northwest Concours d'Elegance held September 7, 2014. 1948 Lincoln Continental Cabriolet The first Lincoln Continental was developed as Edsel Ford's one-off personal vehicle. In 1938, he commissioned a custom design from the chief stylist, Bob Gregorie. The design, allegedly sketched out in an hour by Gregorie working from the Lincoln-Zephyr blueprints and making changes, was an elegant convertible with a long hood covering the Lincoln VI2 and long front fenders, and a short trunk with what became the Continental series' trademark, the externally mounted, covered spare tire. After World War II production was restarted. Ford's Lincoln division would continue to produce the Continental for model years 1946 to 1948. 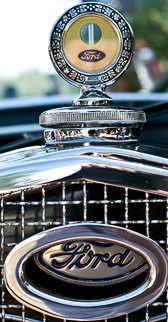 Like all other post-war Lincolns it received updated trim, including a new grill, to refresh the design. Walnut interior trim was added in 1947. To date, the 1948 Lincolns were the last V-12 cars to be produced and sold by a major U.S. automaker. Owner: Tom and Susan Armstrong, Issaquah, WA. Photographed at the Pacific Northwest Concours d'Elegance held September 7, 2014. 1936 Alvis Silver Eagle Sport Touring. With coachwork by Cross and Ellis the Alvis was deliered new on April 4, 1936. 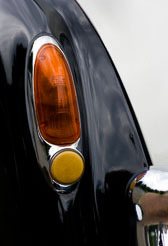 The car resided in England until 1967 when it was purchased by Elazar Bhar of Seattle. After several stewards Mr. George Raab of Redmond purchased the car. During Mr. Raab's ownership the car was restored taking 5 years and 4,000 hours. The car retains its original body, frame, 6 cylinder overhead valve tri-carb engine, full synchromesh, 4 speed transmission and rear end, all of which was either rebuilt or disassembled, inspected and reassembled as necessary during the restoration process. In October of 2013 it we bought the car from the daughter of Mr. Raab. According to her the car went unused for nearly 24 years after its restoration. Owner: Kim and Norma-Sola Pierce, Edmonds, WA. Photographed at the Pacific Northwest Concours d'Elegance held September 7, 2014. 1938 Steyr 220 Roadster. This 1938 Steyr 220 Roadster is one of three known to exist. It was built in Steyr, Austria and the body built by Glaser in Dresden, Germany. The Steyr was a factory demonstrator shipped to Berlin, Germany in 1938. No other Steyr Roadster believed to be in the United States. This car was built for touring and has fitted luggage behind the seat in a special compartment. Steyr built cars from 1923 until 1941. They are still in operation and building marine engines, tractors and small arms. Technology of this/Car was far ahead of its time, with full floating rear axle, wet sleeve all aluminum design engine, four spectrum mission and its streamline art deco design. This makes this car a design for the ages. 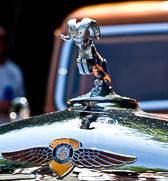 Owner: Peter Boyle, Oil City, PA. Photographed at the Pacific Northwest Concours d'Elegance held September 7, 2014. 1938 BMW 327/28 Cabriolet. The Normans purchased this car in 1997. At that time it was a light yellow color with a white top. The top leaked so was not in the up-position often. After several year of enjoyable driving around the country in rallies, tours, and plain old wandering around Washington it was decided to upgrade the 327/28 body with renewed exterior, fenders, doors, hood and new roof material. The car was improved by Dave Beddows of Canada who then mentioned the driver's door was ready to fall off. Dave brought Jelly Bean Auto Crafters of Surrey, B.C. into the project for a total restoration of the 327/28. Since factory pieces were no longer available, the hood, firewall, lower side sections, 30% of the front fenders and 80% of the rear fenders were fabricated from scratch. The trim, knobs, instruments and bushings were remanufactured. Owners: Steve and Annie Norman, Edmonds, WA. Photographed at the Pacific Northwest Concours d'Elegance held September 7, 2014. 1953 Chrysler Ghia Coupe. In the 1950's Chrysler Corporation Chief Stylist, Virgil Exner formed a working relationship the Italian firm Ghia. Chrysler President K.T. 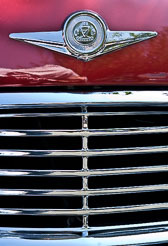 Keller deserves much of the credit for Chrysler's stylistic renaissance of the early 1950s. 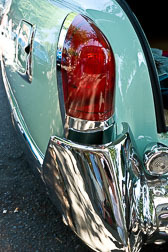 In particular, he hired Virgil Exner to design several “Idea Cars”. Exner's resulting Italian-built dream cars were all usable and running examples that were based mostly on the New Yorker chassis and had "FirePower" Hemi V-8 engines. The thought was to design fully functioning automobiles in limited numbers and possibly use some of design ideas in future production models. These 'idea' cars covered the spectrum of Plymouth, Dodge, DeSoto and Chrysler including this 1953 Chrysler Ghia Coupe. Owner: James Raisbeck, Seattle, WA. Photographed at the Pacific Northwest Concours d'Elegance held September 7, 2014. 1931 Cadillac 370A Sedan. 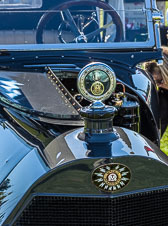 In 1908 and again in 1913 Cadillac demonstrated its precise standardization and inter-changeability of its parts winning the Dewar Trophy in Britain. The V8 engine was introduced in 1914 and became a very reliable power source. Cadillac is largely recognized as one of the most prestigious marques and has lived up to its designation as the "Standard of the World." The overhead valve V 12 engine was produced in 1931 as a companion to the V 16 introduced in 1930. The engines had virtually the same design. The V 12 engine displacement was 368 cubic inches with 135 hp, therefore, the designation as the 370 A series. This car is a 5 passenger sedan with body by Fischer. The wheelbase is 140". The price when new was $3,895. Owner: Ed Rittenhouse, Mercer Island, WA. Photographed at the Pacific Northwest Concours d'Elegance held September 7, 2014. 1954 Cadillac Eldorado. The 1954 Cadillac Eldorado was the second year of production for this limited model. 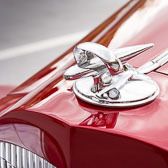 Production reached 2,150 which was an increase from introduction in 1953 of only 532. it After the 53 model that had extensive body modifications, the 1954 only received trim upgrades over the 62 series that helped lower the price. Eldorado used the 331 ci V8 with 4 speed Hydra-Matic transmission. The current owner had an uncle who owned a 1954 Eldorado when he was 14 years old, inspiring him to own this car. Owning the car for almost 20 years, he has had it completely restored to factory specifications. Owner: Paul Hunter, Yarrow Point, WA. Photographed at the Pacific Northwest Concours d'Elegance held September 7, 2014. 1957 Cadillac Eldorado Biarritz. One of 1,800 produced. 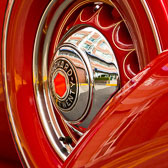 The Eldorado was one of Harley Earl's great designs. A 23 year old designer (Ron Hill) straight out of art school designed the unique rear end on the 1957 Biarritz. This design had inset fins and cast aluminum bumperettes and large, flowing rear stainless steel aprons. 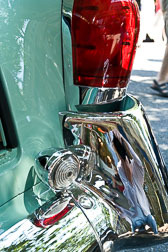 The design is referred to as the "chipmunk rear end" design, referring to the similarity to cheeks on a chipmunk. This car originally came from the Seattle area and has every option available including factory air-conditioning, a 2-4 barrel carburetor and 325 horsepower engine. A 5- year frame off restoration was completed in 2014. Owner: James Peterson, Bend, OR. Photographed at the Pacific Northwest Concours d'Elegance held September 7, 2014. 1960 Imperial Crown Convertible. There were 618 of these cars produced with approximately 31 thought to exist today. Three or four of the remaining cars are believed to be restored to "show room” condition. This car has had a nut and bolt, frame-off restoration. The restoration took over 3,200 hours over 8 years. Many have called this 1960 Imperial Crown Convertible the single best restored car. This car was awarded Grand National Senior Champion by the Antique Auto Club of America just this last spring, 2014. Owner: Joel and Mari Lou Holland, Sumner, WA. Photographed at the Pacific Northwest Concours d'Elegance held September 7, 2014. 1956 De Soto Fireflite Pace Car Convertible. 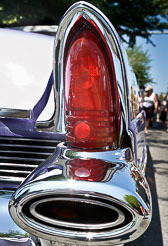 1956 saw the introduction of large scale fins by Chrysler Corporation's chief stylist Virgil Exner. 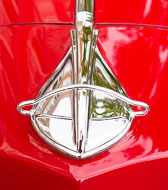 All Plymouth, Dodge, De Soto, and Chrysler featured prominent fins. 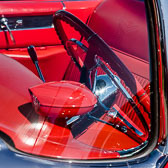 The 50 's were also an era for innovative new ideas such as push-button automatic transmissions, GM's auto dimming headlights, and Chrysler's Highway HiFi, the first record player designed for automotive use. De Soto was selected as Pace Car for the 1956 Indianapolis 500 mile race on May 22nd. This example is one of an estimated 200 or so "clones" that were produced. The cars were powered by a 330ci Hemi V8, producing 255 hp at 4,400 rpm. The factory price was $3,524. Owner: Larry Zappone, Woodinville, WA. Photographed at the Pacific Northwest Concours d'Elegance held September 7, 2014. 1917 Owen Magnetic Model M-25 Touring. 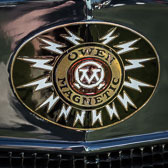 The Owen Magnetic, and ancestor to today's hybrid cars, was one of the most unusual and technologically advanced cars of its time. The drive mechanisms had no direct connection between the internal-combustion engine and the rear wheels. Instead, the engine powered a generator attached to the rear of the engine's crankshaft and caused a horseshoe-shaped magnet to spin. This imparted energy to a steel armature fitted into the air space inside the whirling magnet, causing it to spin via magnetic imbalance. This in turn induced current in the armature of a conventional electric motor, which provided energy to real wheels. Only 974 Cars were built. Owner: Fountainhead Antique Auto Museum, Fairbanks, AK. Photographed at the Pacific Northwest Concours d'Elegance held September 7, 2014. 1914 Franklin M. 30 Touring. Franklin's were built from 1902-1934 in Syracuse, NY. All Franklin's were air cooled and used wood frames until 1928. By 1914, all models were on 120 inch wheel base and had a 32 hp motor. 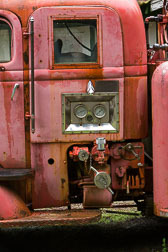 This Franklin was previously owned by Nancy and Dale Westermeyer of Kennewick, WA. The car has toured extensively and in 1976 it was in a transcontinental tour from Seattle to Philadelphia and back. After this tour, the car got its nickname, "Philly". The car has completed a total of 5 transcontinental tours. Owner: Charlie and Lucy Hanson, Port Townsend, WA. Photographed at the Pacific Northwest Concours d'Elegance held September 7, 2014. LeMay Car Museum, Tacoma, WA. September 7, 2014. © 2016 - 2017, all rights reserved.